New York City Mayor Michael Bloomberg held a press conference Wednesday in Washington, DC to denounce the "Shoot First" law conceived by the National Rifle Association and promoted through the American Legislative Exchange Council (ALEC). The law, pushed by its supporters under the name "Stand Your Ground," had been cited in Florida to potentially allow Trayvon Martin's killer to escape liability. "These laws are not the kind of laws that a civilized society should have," Bloomberg said at the event. "This has nothing to do with gun owners' rights, nothing to do with the Second Amendment. Plain and simple, this is just trying to give people a license to murder." Bloomberg was joined at the press conference with representatives from the NAACP, the National Urban League, the National Action Network, ColorOfChange and VoteVets. The groups announced the launch of a campaign called "Second Chance at Shoot First," and launched a website giving a list of the state legislators who supported Shoot First bills and including a petition calling for the repeal of those laws. "Florida was the NRA's first target, and it succeeded in pushing the bill through the legislature over the objections of leading police and law enforcement," Bloomberg said. As the Center for Media and Democracy (CMD) first reported, NRA lobbyist Marion Hammer helped draft the "stand your ground" law in 2005 and first pushed it in Florida, where she reportedly "stared down legislators as they voted." After Governor Jeb Bush signed it into law, Hammer presented the bill to ALEC's Criminal Justice Task Force (now known as the Public Safety and Elections Task Force) months later. The NRA boasted that "[h]er talk was well-received," and the corporations and state legislators on the Task Force voted unanimously to approve the bill as an ALEC model. CMD has documented that Wal-Mart was the corporate co-chair of the Task Force at the time. Once the NRA-conceived "Shoot First" bill became an ALEC model, it became supercharged and spread across the country. In 2007 ALEC highlighted the bill on their "legislative scorecard," and since being ratified as an ALEC model it has become law in approximately 24 other states. "In reality, the NRA's leaders weren't interested in public safety," Bloomberg said at the press conference. "They were interested in promoting a culture where people take the law into their own hands and face no consequences for it. Let's call that by its real name: Vigilantism." While George Zimmerman was indicted later that day (months after he killed 17-year-old Trayvon Martin), he can still assert the NRA-conceived and ALEC-ratified "Shoot First" law as an affirmative defense. Even the jury instructions that will be used in Zimmerman's case were reportedly drafted with input from the NRA. Bloomberg also expressed concern about unrestricted gun laws from other states having an impact on New York City. "Just weeks after the [Trayvon Martin shooting], United States senators introduced NRA-backed legislation that would require all states to honor any permit to carry a concealed weapon issued by any other state," he said. "In fact, Florida authorities have still not, as far as I know, revoked George Zimmerman's concealed carry permit. So if Congress passed the legislation today, he could legally carry a gun in New York City." 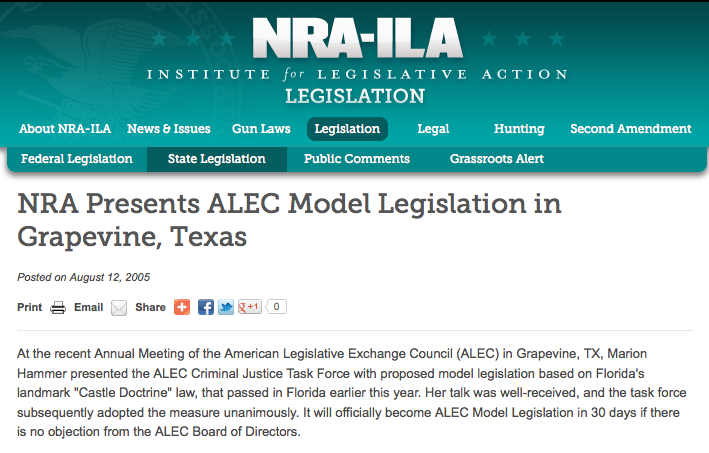 ALEC has been a key vehicle for the NRA to push very similar legislation on the state level. The ALEC Concealed Carry True Reciprocity Act and Concealed Carry Outright Recognition Act, which were ratified by ALEC corporations and politicians in 2004, have largely the same impact. "I'm tired of going to funerals," Bloomberg said. "Police officers across this county's lives are today a lot less safe than they used to be. Your lives and the lives of your children are a lot less safe than they used to be. At some point here we have to stand up as a civilized society and say we're not going to take this anymore." Bloomberg fibbing? Say it ain't so? "Your lives and the lives of your children are a lot less safe than they used to be." Anyone with an internet connection or common sense (yes, real common sense) would know that we are currently enjoying crime rates lower than they have been at any point during the past 50 years. PRWatch. reporting on spin or helping to disseminate spin?